After a Tarkine Forest Adventure visit headed to Marrawah, one of Tasmania’s most isolated settlements, and then to the Green Point Beach and then to the West Point. Further along the road we went to Tarkine Drive to make a stop at Sumac Lookout and then have a walk at Lake Chisholm. The coastline to the west of the town is rugged and remote. It is one of the best board surfing beaches in Australia, although it is very cooooold here, even in summer! To the north, there are views of hump-backed Preminghana (formerly called Mount Cameron West) and to the south the 100000 uninhabited hectares of the Arthur-Pierman Conservation Area. West Point is the most westerly point of Tasmania’s coastline. According to our travel guide book, there was a lighthouse, but at the time when we visited this place (Nov14) the lighthouse had been demolished. The tiny settlement of Arthur River sits on the northern bank of the river it was named for, which at this point runs wide on its way to the ocean. According to a plaque at Gardiner Point, just south of town, this is ‘the edge of the world’; looking out onto an often storm-tossed Southern Ocean the nearest westward landfall - as the crow flies - is the east coast of South America. A popular diversion for visitors is the 14-kilometre cruise upriver through rainforest to the junction with the Frankland River. Wish we could afford to do this cruise, but as we’ve already cruised on the Gordon River, we left this cruise for the next time. A visit to the far North west would not be complete without a trip through the forest reserves in and around the South Arthur Forests - The Tarkine Drive. The Tarkine is one of the world’s great wild places. It is an expansive 447,000 hectare wilderness area of recognised World Heritage significance in the North-West corner of Tasmania. The Tarkine contains remarkable natural and cultural values, including one of the world’s most significant remaining tracts of temperate rainforest. The roads on the maps are marked as gravel, which is NOT true - they were sealed half a year ago. Thanks to the lady at the Stanley Visitor Centre who told us about that. 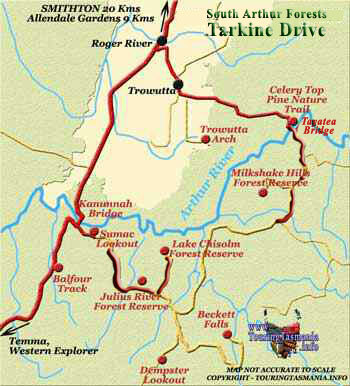 There is a number of places to visit on the Tarkine Drive, including Kanunnah Bridge Picnic Area, Julius River Forest Reserve, Lake Chisholm Forest Reserve and Milkshake Hills Forest Reserve. Based on description from our guide book, we decided to make a stop at Sumac Lookout and then have a walk at Lake Chisholm. Sumac Lookout is located near the road and has expansive views over the Arthur River and forests. Our next stop was at a hidden gem of Tarkine Forest - Lake Chisholm. Lake Chisholm is a flooded limestone sinkhole, one of the many sinkholes in the area, but one of only two filled with water. A gentle half hour return walk takes you through a changing forest walk, huge tall eucalypts tower overhead as huge tree ferns, myrtle, sassafras complete with bearded lichen and blackwood trees grow abundantly beneath them and the clearly marked track is bordered once again by hard water ferns always rattling softly against ones legs. Lake Chisholm is an amazing formation, one of many sinkholes in the area, but one of very few now filled with water. Sinkholes form over many hundreds of thousands of years as water slowly dissolves, deep underground, a very highly soluble rock such as dolomite which is plentiful in this region. As the buried rock slowly dissolves a sinkhole depression is left, usually having a ‘plug hole’ at the bottom where water drains into the groundwater system. At Lake Chisholm the ‘plug hole’ has become blocked with organic matter, thus creating an extraordinary lake, so sheltered by the surrounding forest, towering giant eucalypts and rainforest species, that no wind occurs and the water remains perfectly still, giving crystal clear reflections. This in turn causes the cold water to sit at the bottom of the lake, while the warm water lies at the top creating an environment for an unusual wealth of organisms and algae unique to Tasmania, where they thrive in the rich brown waters of the lake. An amazing and true magical place! No one was there for at least a day, we were alone in the deep forest listening its voice and sounds. Absolutely happy we got back to Stanley when it was almost 7pm and stayed overnight there.